Infielder Thairo Estrada, the No. 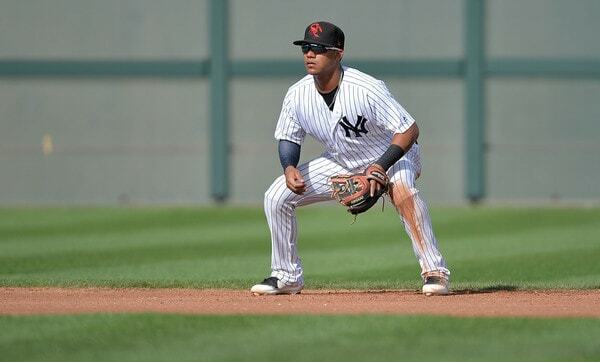 10 prospect in the Yankees’ farm system, was shot in the right hip during a botched robbery in his native Venezuela last month, the Yankees announced yesterday. Estrada explained he was ordering food with his wife when two young men approached and demanded cash and his cell phone. He had neither on him, so they shot him. His wife was unharmed. Estrada spend three days in the hospital and the bullet is still lodged in his hip. Apparently there is no surgery planned to remove it. The situation in Venezuela is very dangerous right now, especially for ballplayers and athletes given the money they make. The mother of Pirates catcher Elias Diaz was kidnapped a few weeks ago and, thankfully, rescued unharmed a few days later. Many players and their family members have been robbed or kidnapped and held for ransom in recent years. Scary stuff. Estrada, 21, was added to the 40-man roster in November and was slated to compete for an infield spot in Spring Training despite having never played above Double-A. He hit .301/.353/.392 (107 wRC+) with six homers and a 10.3% strikeout rate in 122 games with Double-A Trenton last year.